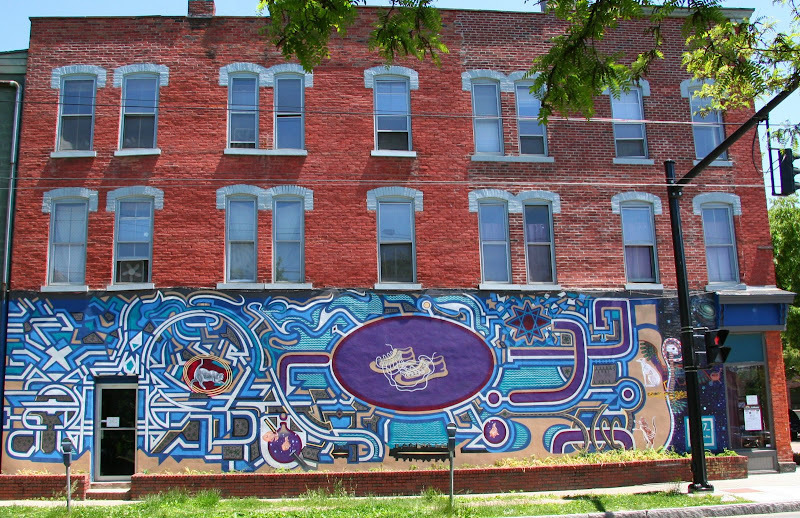 a mural in ithaca on the side of a building with a shop that specializes in hiking shoes among other things. would one consider roller skates shoes? these gals play for burning river roller girls, cleveland's very own roller derby. taken at last year's ingenuity festival unfortunately I missed this year - but I heard it was great. summertime and the living is busy!! I wish I could remember this fellow's name, he's the world famous (well cleveland famous) shoe shine man working in the arcade on euclid avenue. I met him a while back while on a photo safari when blogging bud julien came to check out our fair city. ms t getting some assistance from her friend at this week's ballet lesson. 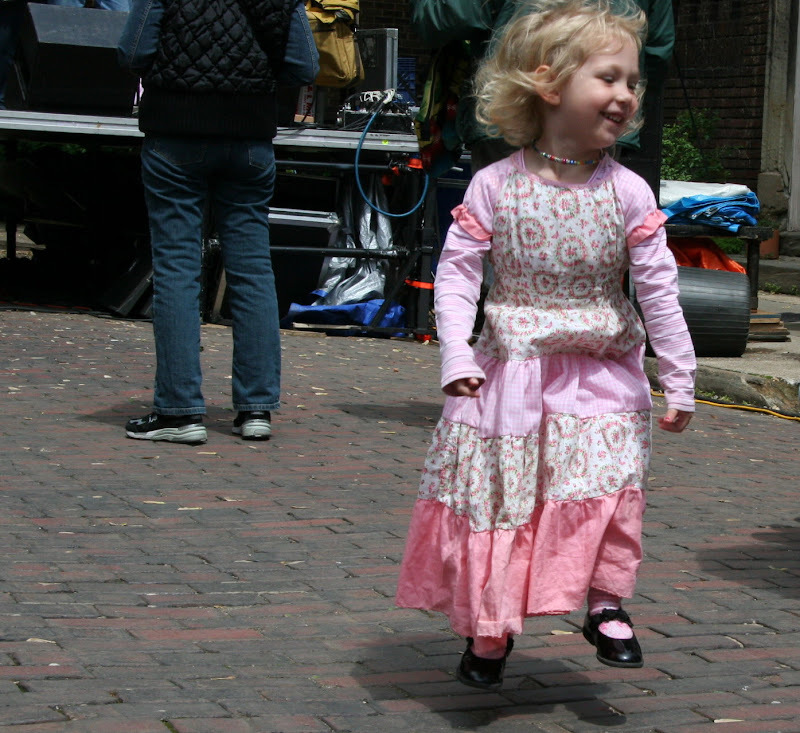 dancing shoes at the 2008 folklife festival. long time readers of the mouse, may remember this pic - shoes was one of the first themes for theme thursday - way back before TT became the phenomenon it is today! what is it with shoes on overhead wires!? I have often wondered if there some special meaning? well, inquiring minds do like to know - in my quest to find out what this ubiquitous urban phenomena means I stumbled on this .... hmmmm okay, I'm still wondering! dorothy's ruby slippers. 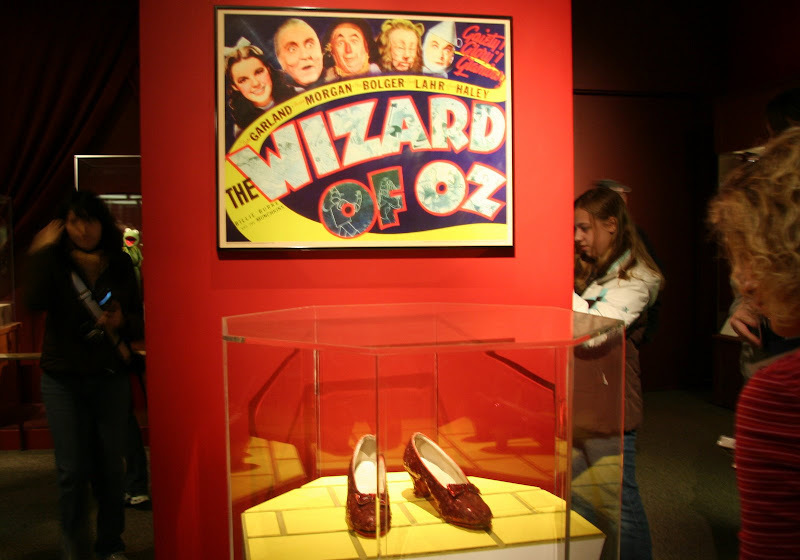 these shoes were designed by gilbert adrian according the portal of all knowledge (wikipedia) at least seven pairs were made for the wizard of oz. the pair in this picture is on permanent exhibit at the national museum of american history in washington dc. anyone notice the other iconic object in this snap? paul simon's diamonds on the soles of her shoes, may be my favorite song featuring shoes! what is your favorite shoe song? if your feet aren't tapping when you listen to this tune, perhaps you need a different pair of shoes. look how young paul and ladysmith black mambazo are in this vid! Wonderfully done as always Mouse. 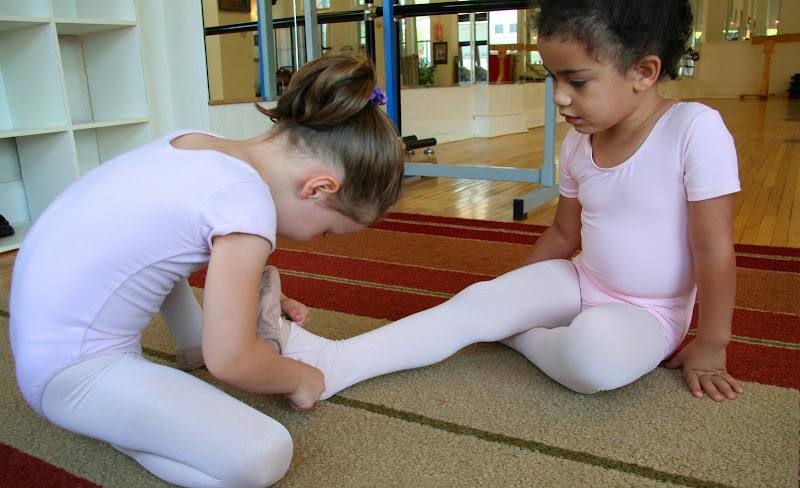 I love the photo of dancing feet and Miss T's friend assisting her with her ballet slippers. Reminds me of my friends helping me tie on my ribbons on my toe shoes a couple of years ago when all I did was dance. Now I run. I'll go back to ballet soon. Love the "levitation" shot. I see the little girl in mid-air and wonder how she got there! Oh, Kimy. Je t'aime bien! 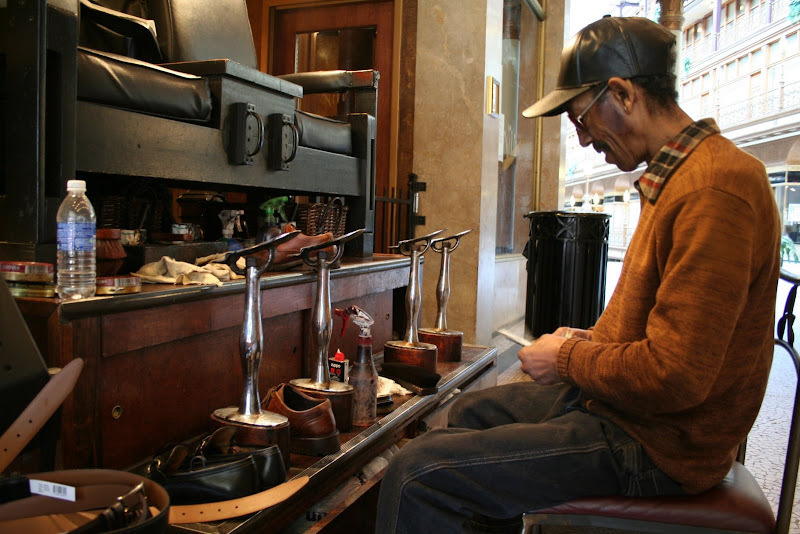 my favorite pic: the shoeshine man. the fact Paul Simon and black mambazo were performing in South Africa gives an extra layer of meaning to the moment at 3:49 where Simon addresses the audience and says: "everybody here know exactly what I'm talking about... diamonds on the soles of our shoes." 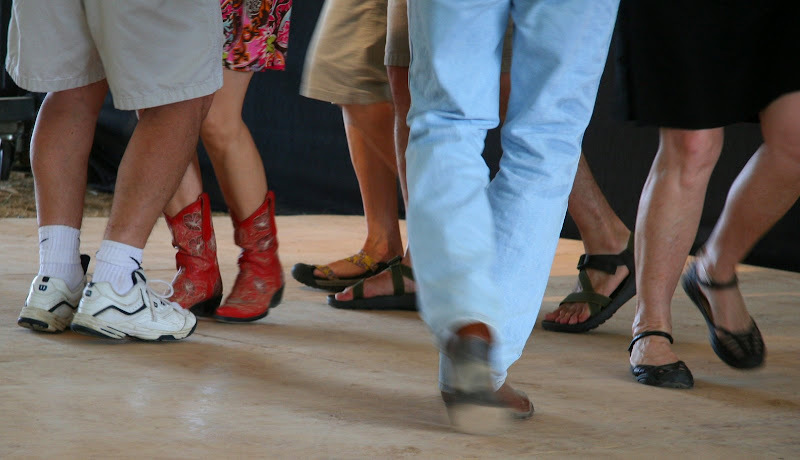 I love the shot of the dancers' legs - those red cowboy boots remind me of Gillian Welch, who always wears a red pair in concert and makes sure she breaks into a fast two-step sometime during the concert (to David Rawlings's excellent guitar-picking, of course) to show them off. We have a lot of those shoes-hanging-from-the-wires around Newport, too. I don't know if it's in celebration of some sports victory or just general Friday night drunkenness. And thanks for the Paul Simon and Ladysmith Black Mambazo video; that brings back fond memories! My favorite is the picture of the shoe shine guy. So mellow and nostalgic. There was a conductor on the El in Chicago when I was living there who was comparable to your shoeshine guy - he welcomed passengers with "All aboard the Love Train". Love the little girl jumping in particular, she looks also as if she has mastered something. Doesn't that photo of the cobbler look straight out of Norman Rockwell? I love that Paul Simon song too! kimy's done it again! Love the Borland quote; goes well with that way cool wall o' colour! And hoping Ms.T shows the interest in ballet, better than Princess cheese did. the photo ere that one looks like she's levitating! Too cool! 'ugly duckling' stage and came out looking like a beautiful swan. wonderful! i particularly love the girls in red hats and the ballerinas. such intent faces. I like the Octopus analogy on talent. Did you know Dorothy's shoes were actually silver in the book? nice shots. ah to be the street sweeper...the pic of the cobbler was my fav. I really enjoyed your post. It is as complete as any I have seen and the photography is excellent. Great title, wish I'd thought of it! I especially like the photos of the shoemaker, the little girl in pink, the little ballerina. They are wonderful images. I wondered if I would find a post with the ruby slippers in it. I thought about that as I coveted those slippers so much when MGM had the original auction back in the early '70s. I did not have the $14k they went for. I did not have any money at all! I haven't yet found another post w/ the ruby slippers which I find surprising. Nice work. I love the mural, Philly has a lot of murals and I love the MLK, Jr. quote, he's one of my favs. I love visiting this blog each thursday, I'm just gonna have to become a follower! There is a guy in Ft. Wayne that won the national shoe repair title...for many years he had a shoe repair shop in our local shopping center...i thought of that when i saw your shoe shine guy. Great pics and quotes. the little pink girl looks as though she could have just learned to fly. I can't say exactly why, but this post touched my heart and made me tap my toes in delight.